On Monday, Rachel and I took a road trip to the sleepy little town of Johnson Creek, Wisconsin. 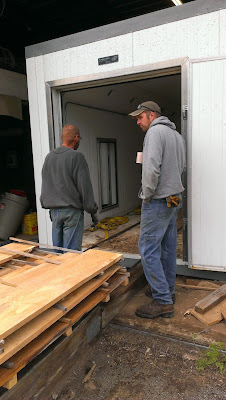 The purpose of our trip was to use a bandsaw mill to saw two white oak logs and to view a lumber drying kiln. The Alaskan chainsaw mill that we have put to work on Arington Tree Farm has given us a stack of live edge, slab lumber. Unfortunately, before we can build anything with it, we will have to get some moisture out of the wood. The passive approach would be allowing the lumber to air dry. However, with the thick slabs that we milled, it would take years to dry to a workable level - approximately 6-8% moisture content for interior applications. However, an electric kiln (like the one in the photo above) speeds the process considerably. This electric kiln that will hold 3,000 board feet of lumber. The wood is stacked outside the kiln in a neat pile and rolled into the kiln on tracks. The speed of drying is influenced by many different variables, but the average load will take two weeks. The second purpose of the trip was to experience the use of a bandsaw mill. The mill in the photo is a Timberking 2000 and it is fully hydraulic. A hydraulic mill is capable of rotating, leveling, and lifting logs with a simple push of a lever. The main benefit of a hydraulic mill is faster lumber production (or quicker sawing). This photo shows me standing at the control panel and flipping levers while the machine does all the work. 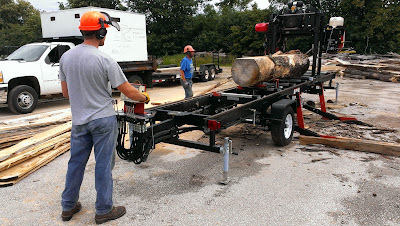 A manual bandsaw mill lacks hydraulics and requires a lot of muscle or additional equipment to position the log for milling. Subsequently, the cost of a manual mill is significantly lower. This final photo shows the two white oak logs, in the center and on the left, after milling. The other two stacks are from the Big Oak. Total time spent running the mill was just under two hours - and to think I was still learning the ropes of the mill! 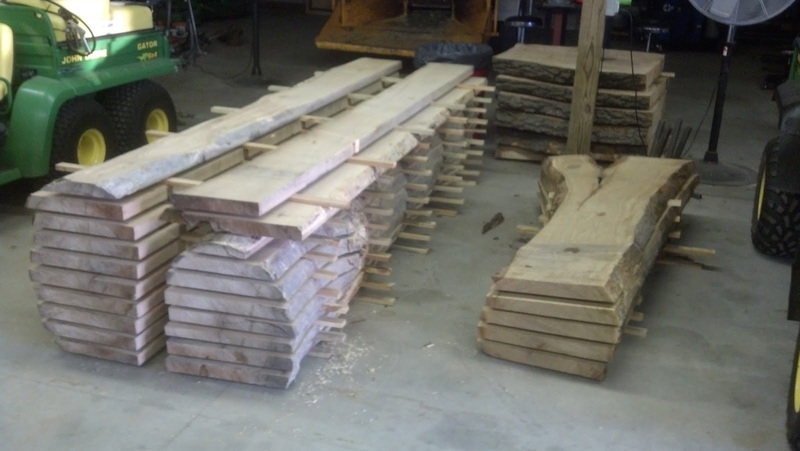 A bandsaw mill is the way to go for high volume lumber production. One additional note about this last photo is how the lumber was stacked. Carefully placed "stickers" or spacers are used to allow for improved airflow and even drying. Stay tuned to the Arington Tree Farm blog and Facebook page to see how I get creative with the use of all this lumber or send us some suggestions! It's vital to pick quality warmth treated timber suppliers so you know you're getting quality materials and that they will really touch base at their destination. Heat treated wood must be dealt with in an unexpected way. Really good article. Thanks for taking the time to explain things in such great detail in a way that is easy to understand. Pruning a tree can have many benefits. The first and most important is keeping the people around it safe. A dead branch can fall from a tree at any time, endangering nearby people, buildings, and power lines. If you want to know more information about tree trimming services, don't forget to visit itrim4u.com. It really important for us.Keep sharing More Information! Business lumber is essentially any lumber exchanged the free market framework, purchased or sold at either the retail or discount level. It comes in numerous structures, sorts and species, and is by and large reviewed into classes of value to empower clients to choose the quality most appropriate for their motivations. Dear Arik, your post has one thing that caught my attention! Its information is more useful than many other articles on this topic. Anyway, can you extend your supports a little more with on wood lumbering saw? That would be a great help to our website Spottingpro and most of its potential readers.